Choose between two bedroom and premium penthouse accommodation. The contemporary two bedroom Waterloo East Apartment features fresh decor with bright open-plan living and dining room create inviting spaces. Large windows add to the apartment's overall appeal. Guests can enjoy views of the city's iconic skyline from the comfort of the apartment's balcony. The apartments benefits from 2 bathrooms. It has one family bathroom with tub, shower, sink and toilet and a second ensuite bathroom just off the master bedroom with shower, toilet and sink. The property houses up to five guests with a sofa bed in the living room. Lambeth North Underground Station. Waterloo Station is a ten minute walk. 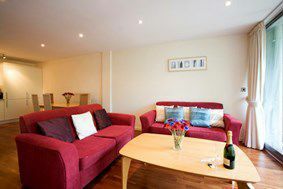 Southwark is within walking distance of the serviced apartments Waterloo location.